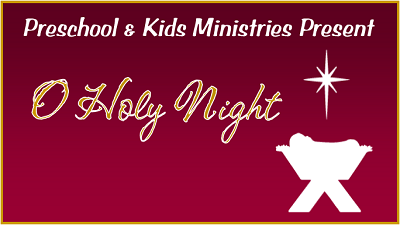 Legacy Adults // 8:30 a.m.
O Holy Night is our family event that kicks off the Christmas season. The evening includes a live reading of the Christmas story, a delicious snack, crafts, and a photo opportunity with Mary & Joseph as you peek into the town of Bethlehem. Families with children birth through 5th grade. Please Register to help us plan for your family. Early registration will close at midnight on Thursday 11/29. Walk-in registrations will be accepted. Biblical Teaching. Passionate Worship. Authentic Ministry.